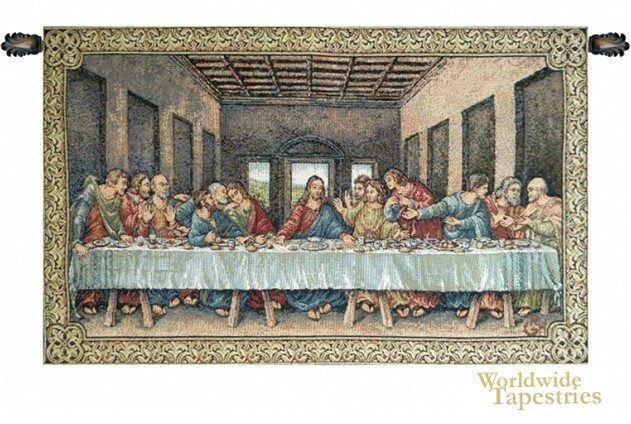 Filled with dramatic action and foreshadowing of the betrayal that is about to occur in his life, Christ hosts The Last Supper, one of Leonardo da Vinci’s most well known and best loved works. A brilliant inventor, artists and visionary, even during his own life, da Vinci’s “The Last Supper” is one of the most important works of the Renaissance. It was painted somewhere between 1494 and 1498. Reproduced in many forms, the original oil painting by da Vinci loses none of its beauty in this tapestry. If one could travel to the Dominican convent of St. Maria dell Grazie, one could readily compare it with the original, which still hangs there in a place of honor. You can hang it in its own place of honor in your home, thanks to this wonderful reproduction. This tapestry is lined and has a tunnel for ease of hanging. Dimensions: W 86" x H 55"